It was a sloppy game at the Galen Center Thursday night, as USC led the Division II Tigers by 20 points at halftime before being outscored in the second half. Byron Wesley led the Trojans with 15 points, Omar Oraby had 13 points with both finishing with eight rebounds, while Nikola Jovanovic had a career-high 14 points on 5-of-6 shooting. The Trojans let West Alabama shoot 8-of-14 from threes in the second half to cut the deficit from 24 to 8, but a few transition baskets put the Tigers away for good. USC ended last season with two Wake Forest transfers on the roster. Right now, they have none. Ari Stewart was declared ineligible for 2013-14 over the summer, and the school announced Thursday that Terrell is academically ineligible for the fall. He played in three games, averaging 10 points per game. Andy Enfield said the earliest game Terrell could be back would be December 19 against Long Beach State, but one should also take into account that first semester grades are not posted until a week or two after the semester ends, and the wait could postpone his return. “If he does well on his finals, he’ll be eligible to play after the first semester is over,” Enfield said. The loss is a big blow for the Trojans, as Terrell was the highest returning scorer and was a senior captain. If it wasn’t already, the pressure is now on Byron Wesley and Omar Oraby to emerge as senior leaders and carry this squad. J.T. Terrell was not on the bench Thursday, and is not allowed to practice with the team while ineligible. After taking a 23-point lead over the Division II Tigers, USC once again put their foot off the gas in the second half and allowed their undermanned opponent to cut the deficit to 8 with 5:42 to go. For whatever reason, these Trojans let the Tigers take open threes. To no surprise, the shots fell. “We have to do a better job of not relaxing,” Oraby said. “Against bigger teams, [if] we let teams get back in the game, it won’t be that easy for us to win.” The Trojans will find that out in a week when they take on Villanova in the Battle 4 Atlantis Tournament in The Bahamas. Jovanovic’s 14 points came from behind the three-point line, in the paint and from jump shots. The 6-foot-11 Serbian was a mystery heading into the year, but he’s emerged as an in-and-out power forward that should be in the starting lineup for the foreseeable future. 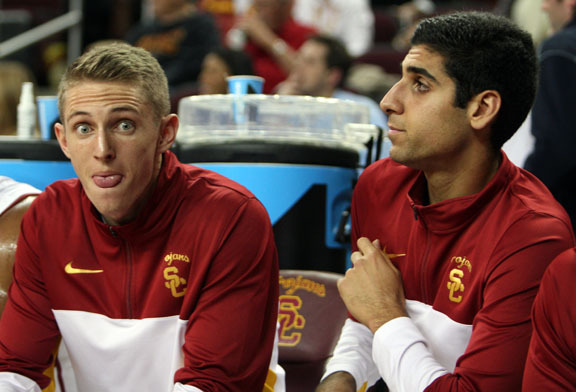 With him in the fold, USC has an international flavor in the front court. Enfield thinks that the young Serbian is learning from Oraby as he goes, for better or for worse. “Sometimes when Omar gets lazy, Nikola gets lazy,” the head coach said. When both are playing aggressive, they’re difficult to stop, especially with Jovanovic’s range. When both are lazy, however, USC gets worked by players half a foot shorter than them, like Thursday night. “It’s all going to come down to how hard we play and how we play together,” Oraby added. Hope that tonight was a wake-up call. The Trojans outmuscled the Tigers down low, out-rebounding them 48-34, but their man-to-man defense on the perimeter left much to be desired. The Tigers took 29 three-pointers and made 11 of them, while missing plenty of easily convertible opportunities. Jacobs and Howard will be seeing plenty of time next to each other this year, but will be punished against more talented opponents if the intensity doesn’t improve on defense. “We lost some focus,” Enfield said. We missed a lot of easy shots in the second half and gave up a lot of threes.” West Alabama’s Cordell Pope made three straight threes in the second half at one point, and his team went 8-of-14 in the second half from beyond the line. The Trojans won their fourth straight game. Those opponents have been from the Big West, Big Sky and Gulf South Conferences, but it’s their first home four-game winning streak since 2010, where they also beat Cal State Fullerton and Northern Arizona in that stretch. 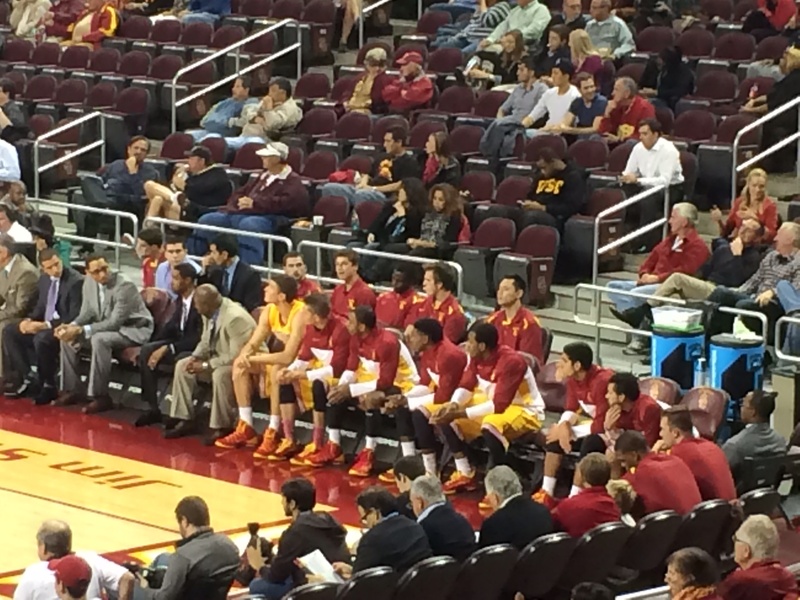 The Trojans are undefeated at the Galen Center, but the atmosphere has been lukewarm at best the last two games. The opponents are anything but marquee, and the last two have been weekdays, but the attendance at Florida Gulf Coast is topping what Andy Enfield is seeing so far at Galen. With 7:35 to go in the first half, Julian Jacobs skied across the lane to block what looked like an easy layup for Pope. Brendyn Taylor grabbed the rebound, then pushed the ball up court before Jacobs received the ball and dished it to Oraby, who slammed it in with one hand. Once again, big dunks come off big blocks on the defensive end. After Nikola Jovanovic swatted the ball out of the opponent’s hands, Jacobs ran a backdoor cut and slammed home a lob from Pe’Shon Howard. This came at a crucial juncture, as USC had let the Tigers cut the lead to 8. Tonight was the career debut for freshmen walk-ons Rex Pflueger and Samer “Sam” Dhillon. Pflueger entered midway through the second half, while Dhillon and fellow walk-on Daniel Munoz entered with 1:07 to go in the game. Munoz missed an open corner three, while Dhillon took an off-balance mid-range shot that went too far right off the back iron. Chass Bryan, as usual, was part of the rotation and finished with two points and three assists. USC will pack their swimsuits and suntan lotion as they head to the Bahamas next week for the Battle 4 Atlantis Tournament. They face Villanova (3-0 as of Thursday) in the opening game. If they win, they’ll likely face Kansas in semifinals while a loss would likely pit them against Wake Forest. They’ll be in a vacation setting, but Enfield and Co. will need to see serious improvement to avoid going 0-of-3 in paradise.